Seven came home a week ago with a plan to fill this box with coins. She would do her daily "duties" (getting dressed, brushing teeth, brushing hair, packing up backpack etc. and the reverse on the flip side) and in exchange we'd put $0.50/day in the box. Grandma would, hopefully, match the donation. It's due tomorrow and we're scrambling to find enough change to fill the box tonight. Needless to say, Seven is already a much better person than I was at that age. The following story is one of those family lores that is requested on a regular basis at bedtime: "Tell me a [Blogauthor] and [Cousin] story! . . . The one about the pumpkin!!!" When I was little, we didn't go to the pumpkin patch to get pumpkins. They were all out on this little platform at our local grocery store, Food City. Let's just say that this store was no Kowalski's. It was seriously named Food City and I remember many community events in the big Food City parking lot: pancake feeds, rummage sales, and, of course, pumpkins. This particular year, I was determined to have the biggest pumpkin on the lot. Every time we'd walk by the pumpkins, on our way to shop for groceries, I'd nag at my mom, hanging back and picking out the biggest one. And every time she'd ignore my pleadings. As Halloween approached, I knew I'd have to take matters into my own hands. Cousin has an older sister--about five years older than me--who would plant seeds in our heads about life's possibilities. I reached into this little bag of tricks she'd built for us, and came up with a "fundraising plan" to get the money to buy the biggest pumpkin: get a pop cup from the Runza Hut in the same shopping complex, head over to K-Mart (I shudder now to imagine Seven crossing the enormous and very busy street that we crossed to get there. 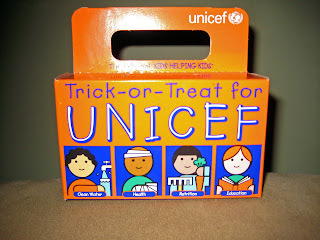 I know, by triangulating these events around other major occurrences in my life, that we had to have been about 8 when this happened) and set up shop outside, posing as fund raisers for Unicef. I don't know why, but the plan actually worked. Despite the fact that we were "collecting" for Unicef with Runza cups, people dropped nickels and dimes in the cups, and we looked at each other in shock as the coins clinked together at the bottom of the cup, people passing by without questioning our true motives. At one point, I got an elbow in the rib from Cousin, looked up, and saw one of my mom's good friends approaching. She saw us and smiled what I thought, even then, was a naive smile, dropping an actual five dollar bill into the cup. It was at that point we felt seriously guilty. Not guilty enough, however, to track the people down, return the money and apologize. Or ACTUALLY give the money to Unicef. Having landed the big load, we headed right over to the Food City pumpkin platform, practically drooling and dizzy with the excitement of having the freedom of getting to actually GET the largest pumpkin on the entire lot. I can't remember even how we chose it. I can't remember how much it cost. I can't remember going in to pay at all, or eating the candy that I'm sure we purchased with the leftover money. All of that is gone. My next memory is having the pumpkin, turning to Cousin, and realizing that we had no way to get it home. We hadn't considered actually HAVING the pumpkin. We hadn't considered anything at all beyond the moment of picking it out. What would we tell our moms? How had we paid for it? How would we carry it home? It was bigger than us! Going home and getting a wagon and coming back the four blocks each way was too much of an eternity to us. I'm sure I tried to con Cousin into going for me so that I could keep watch over my Great Pumpkin, but she'd have nothing to do with that. In retrospect, I'm surprised she didn't take me up on my offer and leave, never to return to me and my pumpkin. My next best plan was to roll the pumpkin home. It wouldn't be too difficult as it was downhill much of the way. I was convinced it was possible. You probably know what happened to the pumpkin. My karmic justice was immediate. Before we even made it to the bottom of the hill, it was so severely pockmarked, that you could hardly even tell what it was. We abandoned what was left of it it at the curb and headed home. Here's a poem I wrote about the experience a couple of years ago with a few changes to protect the innocent. Mom never let me choose the biggest pumpkin. Until I saw one of my Moms’s friends approaching. In their own bottom-of-the-cup rendezvous. Echoing for the last three decades. That's the funniest thing I ever heard. I don't think I've heard this story, or maybe I mentally blocked it out of my mind, thinking I had a hand in raising the two of you. Was that Alice who gave you the fiver? Yes! And no... You and mom had no clue what we were up to... Too much time on the phone with each other (despite being just a block away) smoking cigs and drinking pots of coffee! But man, we had a blast. And yeah, it was Alice that put us over the top.